Birse, the construction company involved saw fit to commission a commemorative variant of the lesser-spotted Lincoln to proudly mark this historic occasion and the J-pegs below show it off in all its weathered glory. It has to be almost 6 years old at least now and looks like it’s seen the inside of a dishwasher more than once, given its faded lustre. One only hopes there wasn’t too much self-congratulatory back-slapping going on whilst its owner was having a hot one, as this could have resulted in scalding. 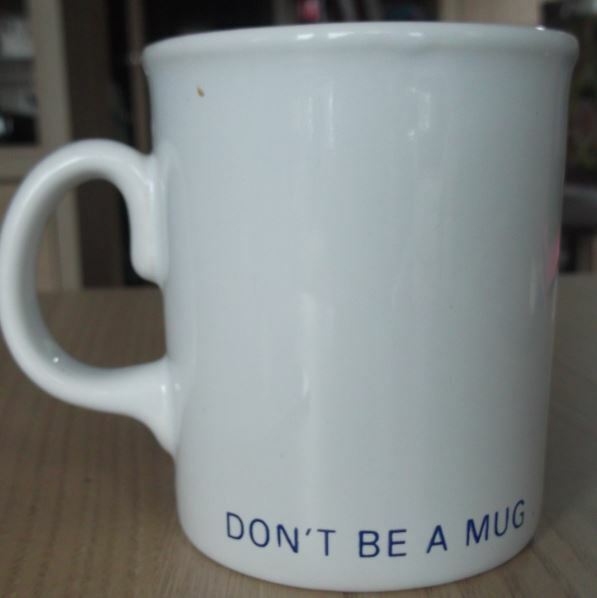 This Mug just screams ‘Nineties’ to me. It must be the bold serif fonts and drop-shadow. However it’s a pert little proto-Atlantic and makes a very worthy companion-piece to the ‘Barratt’ entry already in our annals. 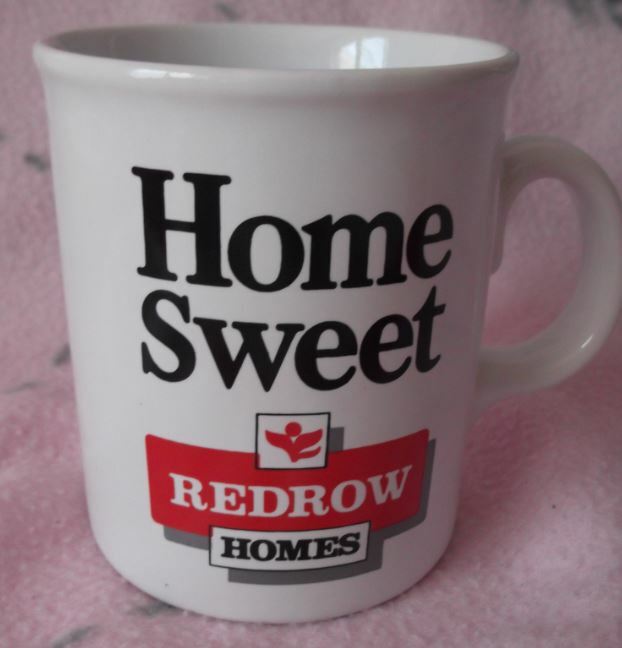 Back in the day I don’t recall any TV ads for Redrow, only press. Of course home building and the housing industry have had a fallow few decades but now there are signs newer houses are being built and if only the greedy supermarkets would free-up some of their annexed land-banks, it might alleviate the situation further. However, lets face it though, who on earth these days can even afford a deposit on a two-up, two down terrace, let alone a Redrow new-build? Their ‘About Us’ Web-waffle states: We pride ourselves in delivering quality home (sic) to our customers and value to our shareholders. Redrow is one of the UK’s leading residential property developers, aiming to be the developer of choice for customers, colleagues, landowners, suppliers, subcontractors and investors. The company has a reputation for imaginative design, build quality and customer service, with the skills needed to complete a wide range of developments – from large greenfield sites to complex brownfield regeneration schemes. Greenfield? Brownfield? Have they not tried ‘Strawberry Fields‘, where nothing is real? When spotting this Lincoln in a Blackpool Thrift Shop my mind was catapulted back to the TV ads for this feline feast and recall the said moggie scraping into the can (pretty much the same as us here, gouging the bottom of the proverbial barrel looking for mugs) and eating the food off its paw. Between 1966 and 1975 in the UK a cat named Arthur was hired by the pet-food company, Spillers. Arthur’s particular skill was that he could scoop food out of a tin with his paw, leading to his appearance in 309 TV commercials. His career blossomed, with his picture appearing on T-shirts, towels (Trade Mugs Anyone?) and in various other advertising campaigns. Sadly, Arthur died in February 1976, just before his 17th birthday. 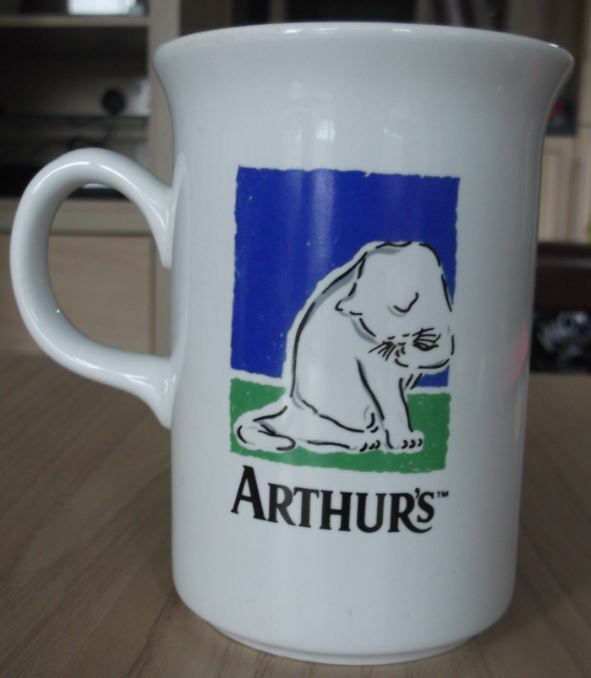 In January 1987 at the Savoy Hotel in London, Spillers launched Arthur II who was discovered at an animal shelter. Like his predecessor, he too could scoop food from a tin with his paw. He could also place his paw on anything near him upon the command ‘paw’. Arthur retired after nine years to make way for a younger cat, who by coincidence also came from the same animal shelter. The mug itself seems almost second-fiddle when placed against the backdrop of such intrigue. It is however a rather tasty hybrid-Lincoln with a tri-colour illustration of Arthur himself cleaning his infamous paw. Usually I’d be extolling the virtues of the front of a mug but it’s the derriere of this jaunty Lincoln which grabs the attention. It’s the first time I’ve seen humour (or is it a threat?) used on such a VesSEL and this reinforces the frontal elevation’s call to arms: ‘Share In The Action’. 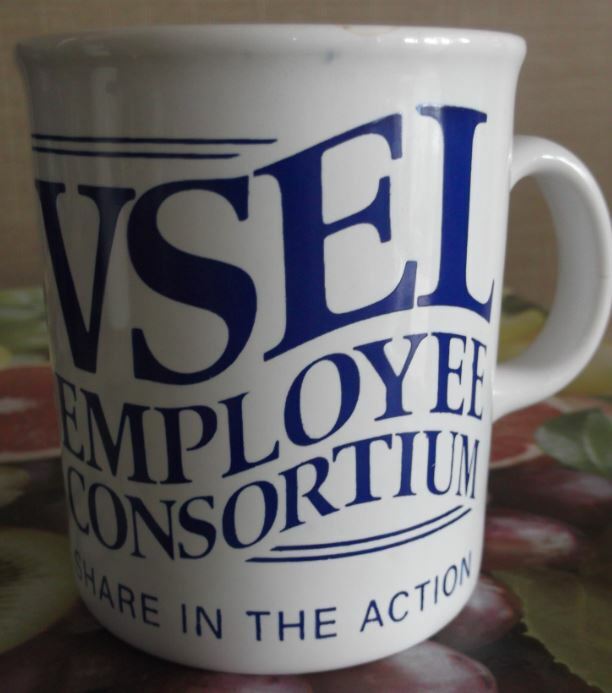 Now with such a bold statement I’d expect the ‘VSEL Employee Consortium’ to be an adrenaline-fuelled thrill ride of an organisation but it transpires they are an Employee led company born out of the advent of both Vickers Shipbuilders & Camel Laird withdrawing from the private sector to form a new company which floated (ahem) on the Stock Exchange in 1985. Since 2007 the consortium is now known as “BAE Systems Submarine Solutions”. It is not known if their share price took a dive as a result. There was a time dear Spotters (even as recent as the early 90’s) when home ownership in the UK was an attainable dream and one which was within the grasp of many ordinary decent hard-working folk. Recent decades have seen successive terms in power of governments & banks which have frankly quashed, no, obliterated that dream for almost everybody now in the UK with the first rung of the housing ladder out of reach for many people for years & years to come. Before our fair isle economically self-imploded Barratt were one of a number of prolific builders throwing up “desirable” plots of new builds with promises of (Oak leaf scheme) part-exchanges and great deals for first time buyers wowing our imagination with all-action TV adverts, for some reason, involving voice-over men being jetted onto plots on Barratt-liveried helicopters. If you don’t believe me check out this link. Anyway, a remnant of this golden age of prosperity is this Lincoln, rescued doubtless from one of their now redundant show-houses. 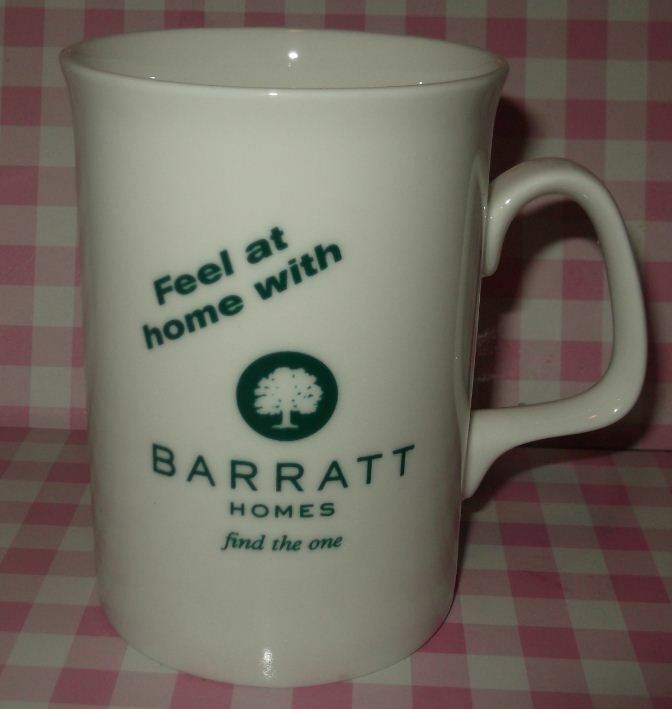 At least we here can give this mug a home it so rightfully deserves. We are hounoured to present a third confirmed Charity Shop mug-spot in the shape of this elegant 2-Colour Lincoln. The Old Rock in Bury is awash with such outlets and it was in the Cancer Research Shop where I rescued this gift-aided trinket for 30p. 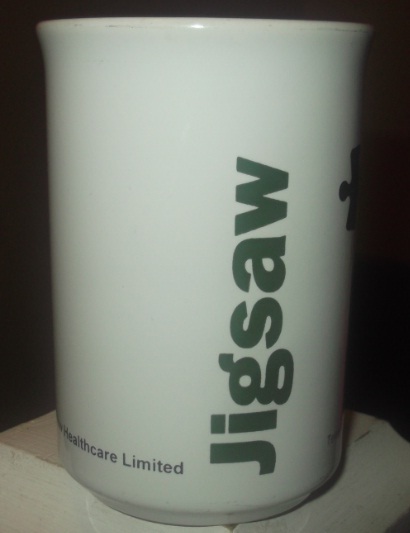 If you search for Jigsaw Health on the Interweb, there’s not much there except for a few contact entries on Directory page sites. 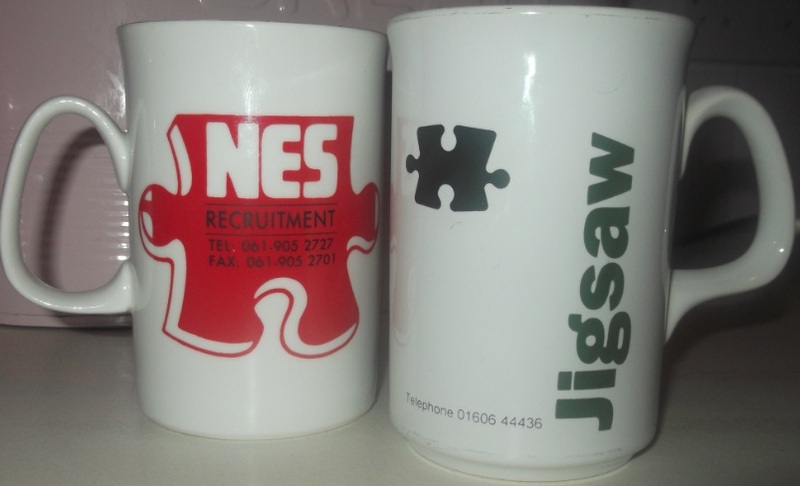 More astute Spotters will recall a similar Jigsaw logo on our recent NES Recruitment entry, in fact there’s an additional shot below showing some mug-on-mug action comparing the 2 artefacts. 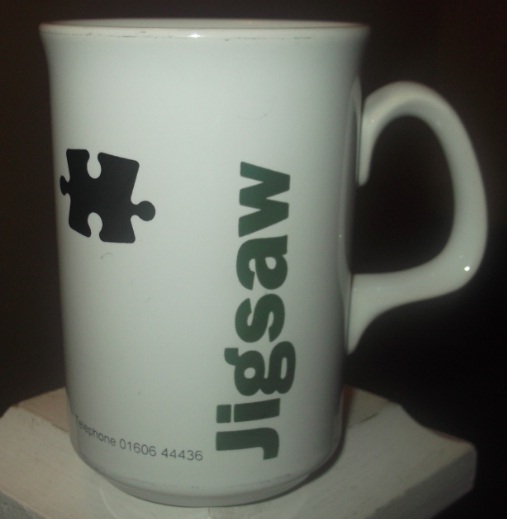 What I’d love to know is why do companies, who like producing trade mugs (which seem to end up in Charity shops), think it’s clever to use a jigsaw piece as part of their corporate identity? I’m here all week. Try the mutton gravy.